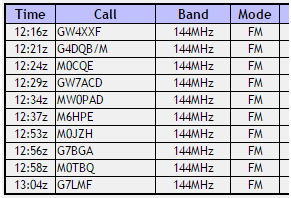 M0PLA/P SOTA Activations: 24th June 2017. GW/NW-015 SOTA Activation visit. Grid SH 837194 Altitude 779M. Today's revisit to Glasgwm after our failed attempt two weeks ago. We set off at 08:10 a.m. and made our way down the A5 from Telford and then followed the A483 towards Welshpool then A458 towards Dinas our final destination. We arrived 09:50 a.m. making better time than our last visit and also planned on a different car parking area. We parked outside the gates to Gesail on the grass just off the track. There was no one around to ask and we saw nobody all day. We started our Ascent at 09:55 a.m. and started to follow the path, soon finding out this is not an easy ascent, very steep most probably 90% of the journey. We entered the cloud cover at around 500 meters and stayed in it until we came back down to around the same place. I have added our route on the picture below, as you can see the route is not the marked route on the map as this does not exist. I followed the route suggested by M0DFA (David) and as he said follow a compass bearing once you leave the fence line near the top SH836188. Especially in bad weather, our visibility was about 20 meters at best. A word of WARNING the lake can be very dangerous in bad weather as seen in the pictures below it just appeared out of the cloud cover and you could easily fall in. We activated the summit on 2 Meters with a mixture of QSOs on my Yaesu FT 817 and my new Handheld Yaesu FT207E I had some very good reports on the audio of the handheld, I must admit that I had tested this a week earlier and had bad audio reports. After doing a little surfing on the net found that there was a problem with the water proofing covering the mic, so I had removed this earlier in the week. (warranty gone but good reports on audio).